Going To The Sun Road, Montana | Classic Route, Best Mountain Views! For anyone hoping to make their way through the Glacier National Park in Montana, the “Going-to-the-Sun” Road is the only way to do it. It is the only road that travels through the park and this has led to its amazing popularity among tourists and locals. If you are planning to explore this route as part of your vacation in Montana, you can pick up a car rental in Seattle, Portland, Boise or Calgary. To save back tracking, the Going-to-the-Sun Road can be done as a one way car hire between these cities, or some of the smaller towns in the region. The road is both a National Historic Landmark and a Historic Civil Engineering Landmark that stretches over a distance of approximately 85km. In the winter, the snow at Logan Pass is extremely difficult to plough since it can reach 24m in height! As a result, there are regular avalanches during the early spring months and the road remains closed until late June or even early July when it is safe to navigate. The road is also restricted for certain vehicles due to the fact that it is fairly narrow at some parts and there are some sharp turns. Recreational vehicles, campers, motorhomes, trailers and any other vehicle that exceeds the size limit for the road will not be allowed beyond the large parking areas on either side of the route. Some of the main attractions along the way include the spectacular lakes. Lake McDonald and Saint Mary Lake are of the most famous and have some of the best views. The famous Bird Woman Falls is also located within the park and can be seen from over 3km away. If you want to see it in full flow, the best time to visit is during the late spring to early summer months. The falls have been known to stop flowing during the autumn since they are fed by a remnant glacier. Another stunning waterfall is called the Weeping Wall. It is a natural waterfall that seeps from the side of the Garden Wall and is fed by run-off water from melting snow. If you enjoy hiking, you should certainly take the time to explore the Trail of the Cedars. The first portion of the path is just under 1km in length and is paved. Some of the cedars along the way are 24m in height. Later along the way, you can choose between two different routes. One loops around and the other, longer route, takes you all the way to Avalanche Lake. 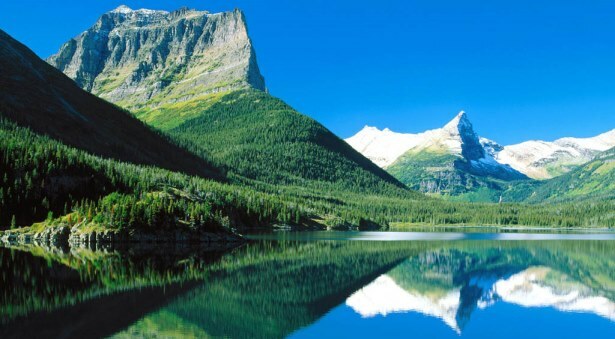 Other top attractions include Heavens Peak, Logan Pass and the Jackson Glacier. You can also expect to encounter various forms of wildlife including mountain goats and some lovely wild flowers too. This trip can be completed in a few hours but, if you really want to make the most of your trip, it’s a good idea to pack your camping supplies and equipment so that you can spend a night under the stars. Take plenty of food, water and clothing for various weather conditions.